He's a beautiful man. I'm crying with you - even though I know he's "flying with the angels." Thank you Luke for your world-embracing love. Your smile that captured hearts wherever you went. Update: If you have pictures of Luke that you would like to post, I will upload them here on Speed of Life as a celebration of an amazing life. Please leave a comment below and send any photos to greggchadwick@earthlink.net. 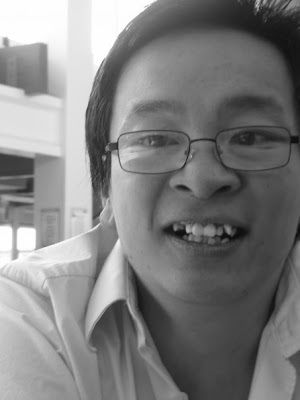 Luke Yen-hui Chadwick, died August 22, 2009 from acute respiratory failure after 3-months’ hospitalization at the University of Washington Medical Center. He was 22 years-old and a 2007 graduate of Bainbridge High School. 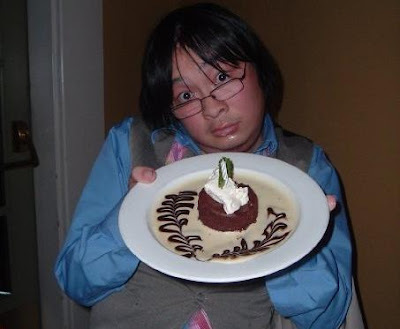 Luke was born Yu Yen-hui September 20, 1986 in Taipei, Taiwan. He came to Washington state to his adoptive parents, Cathy and Kent Chadwick, in 1988. By then he had already contracted the progressive lung disease secondary pulmonary hypertension. Growing up, Luke focused on what he could do, as opposed to what he could not. He perfected the arts of friendship and of living for today. His greatest joy was to make someone smile, which he would effect with any means at hand. His spontaneity, courage, and unselfconsciousness inspired the whole town of Bainbridge Island, where he and his family have lived since 1996. 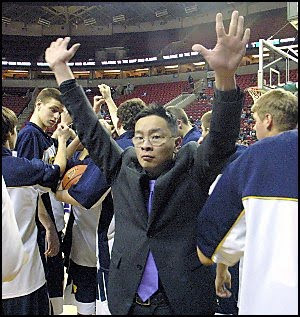 While at Bainbridge High, Luke memorably served as the boy’s basketball team’s manager and unofficial mascot when the team went to the state championship. Graduating from BHS was one of Luke’s proudest moments. In March 2008 Luke received the gift of a double-lung transplant and had 12 months of good health. He became an enthusiastic volunteer organizer for the local Barack Obama campaign. He even travelled independently in the spring of 2009. But a severe case of pneumonia irreversibly damaged his transplanted lungs and led to his final hospitalization in May. Luke’s mom and dad, sister, Ali, grandparents, Bob and Peg, aunts, uncles, and cousins all rejoice for the time they had with their miracle Luke. A celebration of Luke’s life will take place Sunday, September 6th at 3 p.m. at Rolling Bay Presbyterian Church, 11042 Sunrise Drive NE , Bainbridge Island, WA, with a reception to follow for all to tell Luke stories. Donations in Luke’s name may be made to the Pulmonary Hypertension Association, which did so much for him as he fought his illness. The PHA is at 801 Roeder Road, Ste. 400, Silver Spring, MD 20910, or online at www.phassociation.org. To honor Luke’s year of transplanted strength, please consider registering as an organ donor. OUR nation is now engaged in a great debate about the future of health care in America. And over the past few weeks, much of the media attention has been focused on the loudest voices. What we haven’t heard are the voices of the millions upon millions of Americans who quietly struggle every day with a system that often works better for the health-insurance companies than it does for them. These are people like Lori Hitchcock, whom I met in New Hampshire last week. Lori is currently self-employed and trying to start a business, but because she has hepatitis C, she cannot find an insurance company that will cover her. Another woman testified that an insurance company would not cover illnesses related to her internal organs because of an accident she had when she was 5 years old. A man lost his health coverage in the middle of chemotherapy because the insurance company discovered that he had gallstones, which he hadn’t known about when he applied for his policy. Because his treatment was delayed, he died. I hear more and more stories like these every single day, and it is why we are acting so urgently to pass health-insurance reform this year. I don’t have to explain to the nearly 46 million Americans who don’t have health insurance how important this is. But it’s just as important for Americans who do have health insurance. There are four main ways the reform we’re proposing will provide more stability and security to every American. But let’s make sure that we talk with one another, and not over one another. We are bound to disagree, but let’s disagree over issues that are real, and not wild misrepresentations that bear no resemblance to anything that anyone has actually proposed. This is a complicated and critical issue, and it deserves a serious debate. Despite what we’ve seen on television, I believe that serious debate is taking place at kitchen tables all across America. In the past few years, I’ve received countless letters and questions about health care. Some people are in favor of reform, and others have concerns. But almost everyone understands that something must be done. Almost everyone knows that we must start holding insurance companies accountable and give Americans a greater sense of stability and security when it comes to their health care. I am confident that when all is said and done, we can forge the consensus we need to achieve this goal. We are already closer to achieving health-insurance reform than we have ever been. We have the American Nurses Association and the American Medical Association on board, because our nation’s nurses and doctors know firsthand how badly we need reform. We have broad agreement in Congress on about 80 percent of what we’re trying to do. And we have an agreement from the drug companies to make prescription drugs more affordable for seniors. The AARP supports this policy, and agrees with us that reform must happen this year. In the coming weeks, the cynics and the naysayers will continue to exploit fear and concerns for political gain. But for all the scare tactics out there, what’s truly scary — truly risky — is the prospect of doing nothing. If we maintain the status quo, we will continue to see 14,000 Americans lose their health insurance every day. Premiums will continue to skyrocket. Our deficit will continue to grow. And insurance companies will continue to profit by discriminating against sick people. That is not a future I want for my children, or for yours. And that is not a future I want for the United States of America. In the end, this isn’t about politics. This is about people’s lives and livelihoods. This is about people’s businesses. This is about America’s future, and whether we will be able to look back years from now and say that this was the moment when we made the changes we needed, and gave our children a better life. I believe we can, and I believe we will. This is probably one of the longest emails I've ever sent, but it could be the most important. Across the country we are seeing vigorous debate about health insurance reform. Unfortunately, some of the old tactics we know so well are back -- even the viral emails that fly unchecked and under the radar, spreading all sorts of lies and distortions. As President Obama said at the town hall in New Hampshire, "where we do disagree, let's disagree over things that are real, not these wild misrepresentations that bear no resemblance to anything that's actually been proposed." So let's start a chain email of our own. At the end of my email, you'll find a lot of information about health insurance reform, distilled into 8 ways reform provides security and stability to those with or without coverage, 8 common myths about reform and 8 reasons we need health insurance reform now. Right now, someone you know probably has a question about reform that could be answered by what's below. So what are you waiting for? Forward this email. 1.Ends Discrimination for Pre-Existing Conditions: Insurance companies will be prohibited from refusing you coverage because of your medical history. 2.Ends Exorbitant Out-of-Pocket Expenses, Deductibles or Co-Pays: Insurance companies will have to abide by yearly caps on how much they can charge for out-of-pocket expenses. 3.Ends Cost-Sharing for Preventive Care: Insurance companies must fully cover, without charge, regular checkups and tests that help you prevent illness, such as mammograms or eye and foot exams for diabetics. 4.Ends Dropping of Coverage for Seriously Ill: Insurance companies will be prohibited from dropping or watering down insurance coverage for those who become seriously ill.
5.Ends Gender Discrimination: Insurance companies will be prohibited from charging you more because of your gender. 6.Ends Annual or Lifetime Caps on Coverage: Insurance companies will be prevented from placing annual or lifetime caps on the coverage you receive. 7.Extends Coverage for Young Adults: Children would continue to be eligible for family coverage through the age of 26. 1.Reform will stop "rationing" - not increase it: It's a myth that reform will mean a "government takeover" of health care or lead to "rationing." To the contrary, reform will forbid many forms of rationing that are currently being used by insurance companies. 2.We can't afford reform: It's the status quo we can't afford. It's a myth that reform will bust the budget. To the contrary, the President has identified ways to pay for the vast majority of the up-front costs by cutting waste, fraud, and abuse within existing government health programs; ending big subsidies to insurance companies; and increasing efficiency with such steps as coordinating care and streamlining paperwork. In the long term, reform can help bring down costs that will otherwise lead to a fiscal crisis. 3.Reform would encourage "euthanasia": It does not. It's a malicious myth that reform would encourage or even require euthanasia for seniors. For seniors who want to consult with their family and physicians about end-of life decisions, reform will help to cover these voluntary, private consultations for those who want help with these personal and difficult family decisions. 4.Vets' health care is safe and sound: It's a myth that health insurance reform will affect veterans' access to the care they get now. To the contrary, the President's budget significantly expands coverage under the VA, extending care to 500,000 more veterans who were previously excluded. The VA Healthcare system will continue to be available for all eligible veterans. 5.Reform will benefit small business - not burden it: It's a myth that health insurance reform will hurt small businesses. To the contrary, reform will ease the burdens on small businesses, provide tax credits to help them pay for employee coverage and help level the playing field with big firms who pay much less to cover their employees on average. 6.Your Medicare is safe, and stronger with reform: It's myth that Health Insurance Reform would be financed by cutting Medicare benefits. To the contrary, reform will improve the long-term financial health of Medicare, ensure better coordination, eliminate waste and unnecessary subsidies to insurance companies, and help to close the Medicare "doughnut" hole to make prescription drugs more affordable for seniors. 7.You can keep your own insurance: It's myth that reform will force you out of your current insurance plan or force you to change doctors. To the contrary, reform will expand your choices, not eliminate them. 8.No, government will not do anything with your bank account: It is an absurd myth that government will be in charge of your bank accounts. Health insurance reform will simplify administration, making it easier and more convenient for you to pay bills in a method that you choose. Just like paying a phone bill or a utility bill, you can pay by traditional check, or by a direct electronic payment. And forms will be standardized so they will be easier to understand. The choice is up to you - and the same rules of privacy will apply as they do for all other electronic payments that people make. 8.The Trends are Troubling: Without reform, health care costs will continue to skyrocket unabated, putting unbearable strain on families, businesses, and state and federal government budgets. Perhaps the most visible sign of the need for health care reform is the 46 million Americans currently without health insurance - projections suggest that this number will rise to about 72 million in 2040 in the absence of reform. As if Thomas Pynchon is channeling the "Dude". Wonderful, atmospheric clip hearkening back to 1970's LA. The Mayor of Hiroshima Declares,"We have the power. We have the responsibility. And we are the Obamajority. Together, we can abolish nuclear weapons." 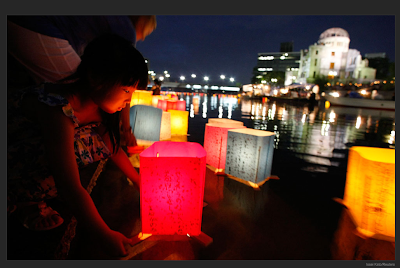 Paper lanterns are released each year on the Motoyasu River in Hiroshima in remembrance of the atomic bomb attack. This year's ceremony on August 6, 2009 marked the 64th anniversary of the 1945 event. President Obama said earlier this year in Prague that “…as the only nuclear power to have used a nuclear weapon, the United States has a moral responsibility to act.” And “…take concrete steps towards a world without nuclear weapons.” I agree with President Obama. I learned not long ago that one of my Japanese friend's father is a survivor of the atomic bomb attack on Hiroshima. In Japanese these courageous people are called hibakusha. My friend and his wife will in the near future take us on a tour of the city of Hiroshima. Even though I have been to Hiroshima many times and I count the city as one of my favorite places in the world, I know that this tour given by the children of a hibakusha will change me in unforeseen ways. The mayor of Hiroshima,Tadatoshi Akiba, is also courageous. Today in his speech marking the 64th anniversary of the events of August 6, 1945, Akiba called for a world free of nuclear weapons. Many would call him naive. Instead, I draw great faith in his hope for the future. 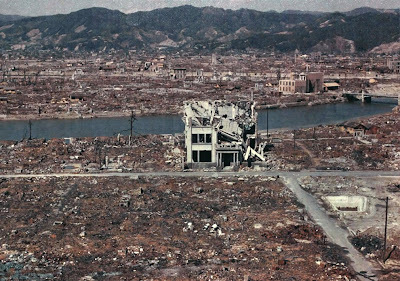 The devastated Japanese city of Hiroshima months after the atomic bomb was dropped. That weapon of human extinction, the atomic bomb, was dropped on the people of Hiroshima sixty-four years ago. Yet the hibakusha’s suffering, a hell no words can convey, continues. Radiation absorbed 64 years earlier continues to eat at their bodies, and memories of 64 years ago flash back as if they had happened yesterday. In response, we support President Obama and have a moral responsibility to act to abolish nuclear weapons. 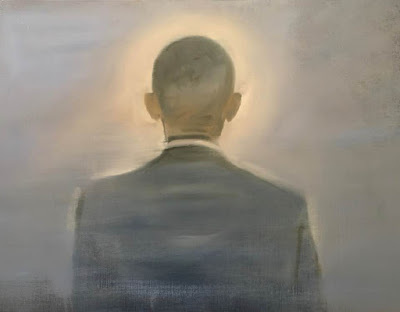 To emphasize this point, we refer to ourselves, the great global majority, as the “Obamajority,” and we call on the rest of the world to join forces with us to eliminate all nuclear weapons by 2020. The essence of this idea is embodied in the Japanese Constitution, which is ever more highly esteemed around the world. Now, with more than 3,000 member cities worldwide, Mayors for Peace has given concrete substance to our “2020 Vision” through the Hiroshima-Nagasaki Protocol, and we are doing everything in our power to promote its adoption at the NPT Review Conference next year. Once the Protocol is adopted, our scenario calls for an immediate halt to all efforts to acquire or deploy nuclear weapons by all countries, including the Democratic People’s Republic of Korea, which has so recently conducted defiant nuclear tests; visits by leaders of nuclear-weapon states and suspect states to the A-bombed cities; early convening of a UN Special Session devoted to Disarmament; an immediate start to negotiations with the goal of concluding a nuclear weapons convention by 2015; and finally, to eliminate all nuclear weapons by 2020. We will adopt a more detailed plan at the Mayors for Peace General Conference that begins tomorrow in Nagasaki. The year 2020 is important because we wish to enter a world without nuclear weapons with as many hibakusha as possible. Furthermore, if our generation fails to eliminate nuclear weapons, we will have failed to fulfill our minimum responsibility to those that follow. Global Zero, the International Commission on Nuclear Non-proliferation and Disarmament and others of influence throughout the world have initiated positive programs that seek the abolition of nuclear weapons. We sincerely hope that they will all join the circle of those pressing for 2020. On the occasion of the Peace Memorial Ceremony commemorating the 64th anniversary of the atomic bombing, we offer our solemn, heartfelt condolence to the souls of the A-bomb victims, and, together with the city of Nagasaki and the majority of Earth’s people and nations, we pledge to strive with all our strength for a world free from nuclear weapons. We have the power. We have the responsibility. And we are the Obamajority. Together, we can abolish nuclear weapons. Yes, we can. The United States bomber Enola Gay which dropped the atomic weapon on Hiroshima on August 6, 1945. May we never forget. And may we abolish nuclear weapons in our lifetime.